A sat receiver for £50? At this end of the market you don't get niceties like HD support, multiple tuners or PVR upgradeability. In fact, we had better make it clear that you don't even get an EPG. That's right – there's no programme guide, which makes the 6630 unique in the set-top box world for the wrong reason. However, as the receiver's name suggests, a USB port is provided for firmware upgrades and basic multimedia playback. And although there are no CI capabilities the 6630 presents you with a card slot. To take advantage of this multi-CAM emulation is provided. This makes the 6630 even better value for money. Also on board are blind scan (which, as we'll discover, isn't all it seems) and full DiSEqC compatibility. The 6630 is enclosed within a casing of fittingly modest dimensions. Yet the power supply is built in and benefits from a rear-panel switch that safely isolates it from the mains altogether. Also on the rear panel are Scarts for TV (RGB or composite, but no S-video) and VCR (composite), a collection of phono sockets and an RS232 port for PC-based firmware upgrades. These provide stereo audio, composite video and coaxial digital audio. A fifth provides a programmable 12V output for non-DiSEqC LNB switches and the like, a surprising feature at this price. A bit too close to the LNB input is a loopthrough output, so fitting these connectors can be fiddly. The much-vaunted USB port isn't on the rear panel. Instead, it resides conveniently behind the front panel, which swings downwards to reveal the card slot and a selection of operating controls that have an excellent positive feel. These take the form of a joypad disc for volume/channel change, menu access and standby. When the 'drawbridge' is raised only the standby button can be operated – a green four-digit channel display is also visible in this closed state. You can access the menus from the front panel, but PIN-protected ones like channel setup need the numeric keys of the remote handset which, in terms of styling and size, isn't far removed from those supplied with budget DVD players. The 6630 may be busy internally but the standard of construction is high and the running temperature will give you no cause for concern. We had it switched on for days and it never became more than comfortably warm. No wizard-driven options here, although the 6630's carousel of five menu categories is pleasantly designed. In the PIN-protected installation menu's 'antenna configuration' option you can tell the receiver whether you're using a fixed or motorised (DiSEqC 1.2 or USALS). You can then go to the following 'satellite list' option and pick the birds you're after from a list of 45. Satellites can be renamed, edited or deleted – new ones can be added, too. The third option – 'antenna setup' – allows you to select the satellite(s) you've just added and configure it. If you're using a fixed dish, DiSEqC 1.0 and 1.1 options are shown – the relevant switchbox position for each satellite can be specified in turn should you have such a setup. This menu looks very diff erent if you're using a motorised dish – there's a choice between USALS or DiSEqC 1.2 instead. If the former is selected your longitude and latitude can be entered. In the 'motor setting' option beneath, satellites (and transponders – complete with signal intensity/quality meters) can be selected from a list and the dish will move to the automatically calculated position. In DiSEqC 1.2 mode the longitude/latitude options are 'greyed out'. The 'motor setting' instead provides east/west movement controls, enabling you to move the dish until a selectable transponder on the desired satellite (selected in a box at the top of the menu screen) is found. The signal intensity and quality displays are once again present – only in this mode they're more useful. A neat trick is that you can define the specific DiSEqC memory location to which a satellite is saved – useful if you're using another DiSEqC-capable receiver (maybe an HD PVR that lacks blind search). A final 'motor setting' menu option looks after setting dish limits. Now that your satellites are defined it's time to go channel-hunting. The first option, again under the 'antenna configuration' umbrella, is 'single satellite search'. Choose the target satellite, select a scanning mode (free – 'FTA Only' – or all channels), specify network-searching if required and select either 'full' or 'blind' from the 'scan mode' box. Hit the 'search' button, and the receiver goes about its business. There are some drawbacks, though. In full-scan mode everything's completely automatic. You can't enter PIDs, FEC or symbol rates because a manual option is absent. Although you can add new transponders (or, for that matter, edit existing ones) with a separate menu, the only parameters that can be entered are frequency, polarisation and symbol rate. Then there's blind scan. Simply put, it isn't; instead of stepping through frequencies it merely works its way through a list of transponders pre-programmed into the machine. Indeed, the two modes are identical in operation with the same search screens displayed. 'Multi satellite search', automatically visits each satellite in turn, moving the dish where necessary and storing any channels it finds on the journey. The same search options of the single satellite search mode are offered. Sadly, it won't pause between satellites. In other words, it doesn't accommodate dish transit times so some transponders could be 'missed'. The search menus may be logically structured and easy to use, but the system they access is disappointing. It's half-finished, in other words. Pressing the 'enter' button to access the channel list. A very welcome feature is the 'find' button – used to 'home in' on a channel by entering one or more letters of its name. Up to 32 favourites lists can be created via the main menu's 'edit channel' option – which has separate sections for radio and TV channels (as well as a 'delete all' feature). In addition to defining favourites these menus will let you delete, sort (by name or encryption status) or edit (rename) channels. As we noted earlier, there's no EPG out of the box even though there's an EPG button on the remote. There is an eight-event manual timer and a sleep timer. You can zoom or freeze the picture of the currently selected channel. If you plug in a (FAT32-formatted) storage device you can display JPEG or Bitmap images. We also discovered that MPEG video clips will play – the receiver does, after all, have the necessary capabilities for TV viewing. If you get bored with broadcasting you can try the 6630's three simple games – Tetris, Othello and Sudoku. The handset might sport a 'record' button (and other 'transport' keys) but, as it stands, you can't turn the 6630 into a simple single-tuner PVR by plugging in a storage device. As we went to press, however, we learned that an unofficial firmware update (card(6630+USB)_11_13) is available on the internet that adds a few missing features. Remember that your warranty will most likely not cover implementing such tweaks and any issues that may arise. Unpack the file, copy it to a USB stick and use the tools menu's 'upgrade by USB' option to install. Recording to USB memory devices is now supported; the new firmware adds a 'rec' option to the main menu. From here you can enable and adjust the size of the timeshift buffer – another new feature. 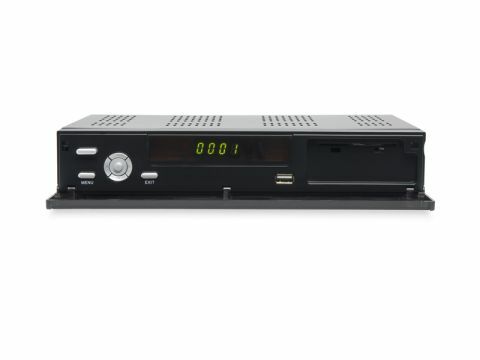 It also adds a full seven-day DVB EPG that can be used to set the timer. You can record by pressing 'record' and you're given a choice between TS (transport stream – more flexible, but larger file sizes) and PS (programme stream) modes. The 'rec' menu's PVR Manager option allows you to select and play a specific recording. If it's a TS recording you get the benefits of additional soundtracks and subtitles – in contrast, recordings made in PS mode contain only the video and main audio. Another benefit of the PS mode is that it generates .mpg files. If you plug a USB device containing recordings made with the 6630 into your computer you'll find that most media player programs can handle the recordings. For a £50 receiver, the performance cannot be faulted. Pictures from channels with strong technical standards – like the German ones on Astra 1x – are crisp and vibrant. It's difficult to tell the 6630 apart from higherend receivers. Sound? Tuning to a classical music radio station like Astra 1x's BR-Klassik rewarded us with a dynamic and detailed delivery. It's also interesting to compare our own radio stations (many of which are carried via Astra 2x). This receiver, connected to a good audio system, was much easier to listen to than the same broadcasts from a much more expensive DAB tuner. The satellite bit rates are higher and so artefacts are less evident. This receiver is also pleasantly responsive in use. Searches were fast and channel changes and menu trawls don't keep you waiting longer than is necessary. But this isn't perhaps the most sensitive receiver we've tested. Difficult transponders that were within the grasp of more capable units were ignored by the 6630. With an appropriate dish and LNB, though, reception of the key Hot Bird and Astra services should be reliable.